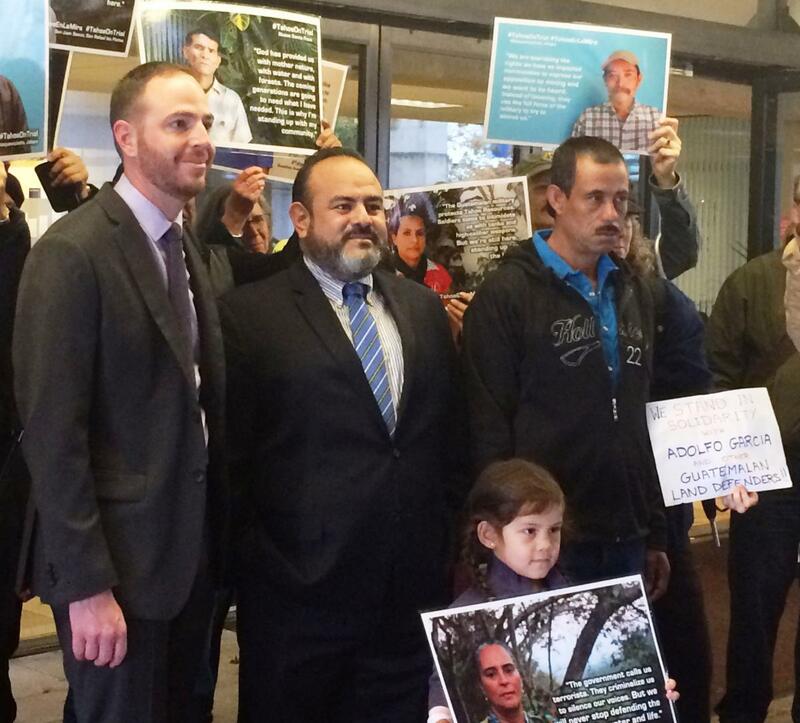 Shortly after the shootings, Adolfo, Luis and the other men launched a civil lawsuit in Canada to hold Tahoe Resources accountable for what happened to them.This was the first time a civil lawsuit had been launched in British Columbia against a Canadian mining company for harms caused at a company's overseas operations. In 2014, a BC Supreme Court judge sided with Tahoe and threw out the case, ruling that the case should be heard in Guatemala rather than Canada. However, Adolfo and the other men persisted and appealed, and on January 26, 2017, the men received word that they won! A panel of Appeals Court judges ruled that the first judge had made a number of errors in her ruling and stayed Tahoe’s motion to dismiss the case. Matt Eisenbrandt (legal advisor from the Canadian Centre for International Justice), Rafael Maldonado (human rights lawyer from CALAS) and Adolfo Garcia (Guatemalan plaintiff) outside the BC Court of Appeal in Vancouver, November 2016. This is the first time in Canada that an Appeals Court has allowed a civil claim against a Canadian company for harms committed overseas to advance. Amnesty International has campaigned for many years for Canadian courts to allow claims against parent companies for the actions of their overseas subsidiaries to be heard in Canada. Amnesty is an intervener in both the Tahoe and Hudbay legal cases on matters of international human rights law. Amnesty International supporters have long campaigned in support of human rights defenders in Guatemala. In 2011, Amnesty activists wrote Urgent Action letters to the Guatemalan government, asking it to not grant Tahoe Resources a mining licence until affected communities were meaningfully consulted. During our 2012 Annual General Meeting in Vancouver, Amnesty members met courageous defender Oscar Morales, who explained what it is like to live in the shadow of Tahoe Resources’ Escobal mine. In 2015, thousands of Amnesty activists again took up their pens and keyboards during Amnesty International's biggest global day of action, Write for Rights, to express solidarity to to Adolfo, Luis and the other men. These letters of support gave the men and their families strength for their legal fight in Canada with Tahoe Resources for compensation for the harms they suffered. While in Vancouver for the appeal hearing in November 2016, Adolfo told Amnesty International Canada's Business and Human Rights Campaigner, Tara Scurr: “My family supports this struggle. My wife is a great supporter of my activism and that of my son. It is her land, it is where she grew up, and she defends it too. Defending the land is very important to my family." Amnesty International will continue to support Adolfo, Luis and the other courageous men and their families on this journey to justice.